In some Prophetic sayings, some expressions are attributed to Allah, Praise and Glory be to Him, such as laughter, pride, disappointment, happiness and hatred, in which scholars have different opinions. The first group said that the Believer should believe in everything Allah attributed to Himself, as the establishment on the Throne, coming, showing up, the descent to the lower heaven, laughter, content, wrath, hatred, and love. He should believe in these attributes as he believes in creation, sustenance, life, and death; this belief must be void of any blemish, misstatement, negation, modality or analogy, and prove these attributes in the way that becomes His Exalted Self, Praise and Glory be to Him. 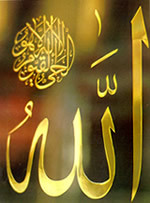 In the Hadith, where the Prophet, Allah’s Prayers and Peace be upon him, said, “Allah delights in people’s repentance, and His Delight outweighs the delight of that man who rejoices over his long-sought camel!”, the Attribute of Delight which is mentioned is one of the true attributes that become His Exalted Self, Glory be to Him. It is one of the attributes that are linked to His Will and Power; He rejoices over the repentance of people and this Delight indicates that He has accepted their repentance. Allah’s Delight is too Exalted from any comparison with the joy and the delight of creatures either in itself, its reasons or its objective. It is the perfection of His Mercy and His Charity, which He wishes that people become subject to; its objective is the completion and perfection of His endowment of blessings to those who repent. They also assert Laughter as an attribute of Allah as becomes His Exalted Self, this attribute is mentioned in the Hadith, “Allah laughs to two men one of whom kills the other, then both of them go to paradise”, His Laughter does not resemble the creatures’ laughter when they are enraptured. This meaning takes place only through His Will and Might, but human beings laugh when they are fascinated on seeing unusual things. In the Hadith mentioned above, we have the narration of the story of a Muslim killed by an unbeliever who, at first, would deserve Allah’s Wrath; one may think that Allah will punish him in this world and in the hereafter; But if Allah, after that, endowed that unbeliever with repentance and guided him to declare faith in Allah and embrace Islam, and later on fought for the cause of Allah and was killed, then he enters paradise. So this is one of the most surprising and awe-inspiring events! This group also asserts Wonder as an attribute of Allah. They prove this by saying that Allah’s Wonder is not the result of obscure reasons or ignorance of facts as is the case with human beings; His Wonder is the result of His Will and Wisdom towards an occurrence taking place in a way that deserves wonder. The existence of a Foot with respect to Allah, Glory be to Him, was asserted on the basis of the prophetic saying, “Every time a group is cast in hell it says: ‘Are there any more to come?’ until Allah, the Exalted Supreme Lord, puts His foot therein, so every place in hell crawls inside itself and it says: ‘Never, my Lord, by Your Honour and Beneficence!’” (HADITH). They say that this saying asserts and proves the existence of the leg and the foot for Allah, Glory be to Him. This attribution as other attributes exists in a manner so Exalted and Supreme that becomes His Greatness and Glory. Allah’s Mercy and Equity dictate and ordain that no one will ever be tortured without having committed a sin, and since hell is unfathomable and abysmal, therefore, Allah fulfills His Promises and puts His Foot therein, hence its ends become close to each other and it becomes filled only with its occupants with no surplus space. The second group said that these expressions are not meant in their literal surface meaning but what is meant is the meaning associated with it; they attribute this epithet to the Divine Will which is derived from Allah’s Existence. It is eternal so they say that Allah’s love to His creature denotes His Will that he is to be endowed with blessings and reward. Moreover, they say that content, wrath, and punishment mean and denote the Divine Will of reward or punishment; they explain delight with its associated meaning which is content, and they explain content as the Divine Will of reward; as for Laughter, they explain it in terms of content and acceptance, the Foot in terms of creation of creatures who deserve the torture of hell. The attributes asserted and proved by the members of the first group such as laughter, surprise, delight, love, hatred, and wrath, are all ascribed to emotions in the lexicon of the Arabic language; they do not denote acts such as creation, giving sustenance, giving benefit, inflicting harm, abasing, exalting, withholding or enlarging, therefore their meanings cannot be compared. Moreover, the members of the first group sometimes say that these attributes are meanings that occur in His Exalted Self, and sometimes they say that these attributes happen to Allah, Glory be to Him! It is understood that everything that is prone to incidents and chances is incidental. Furthermore, most of these attributes that are related to Allah are mentioned in the Qur’an and are not considered as attributes of the Exalted Self, such as (Who relieves the suffering) and (Who hurls the Truth). Thereupon the ancestors perceived that we should neither let the mind delve in allegorical verses of the Qur’an nor in similar verses and prophetic sayings as, for instance, the Hadith related by Al-Bukhari in which it was mentioned that every day the sun goes and asks Allah for a permission to rise, and it is almost ordered to return to where it came from. Hence, it is safer and more appropriate to believe in the Quranic verses and the Hadiths without delving into interpretations or analogies; we have to abandon interpretation after the establishment of the absolute proof that the surface meaning of the word is impossible. We have to say, as our ancestors said, that the Quranic verses and the Hadith pass as they came without interpretation; only Allah knows what is truly meant by them, “..there is nothing whatever like unto Him and He is the One that hears and sees all things” (SHURA, 11), Glory be to Him, He is Allah.